Having raised to fame with the comedy classic ‘The Office’, he has gone on to create more great TV programs (and podcasts!) before moving on to stand-up gigs. With his DVDs receiving some very good reviews. 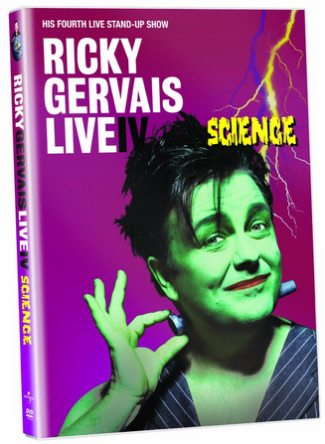 His fourth live DVD called Science, is available from November 22, 2010, you can order it now on Amazon for a decent price. Well known for never being afraid to challenge the boundaries of comedy, Ricky is renowned for his sour observational humour and cutting delivery. This performance is set on a stage which is designed to look like Frankenstein’s castle lab, this show brings together a mix of thought provoking rants and tongue in cheek political incorrectness about diverse subjects such as religion, racism and obesity. The DVD also has some cool extras such as behind the scenes footage. To bring in the release of this latest helping of Gervais, I thought a few videos looking at his past performances would be good. If you are a follower of Ricky then his new DVD may be a good choice on your list for santa!